Since the 1980s, Ruby’s Diner has been taking their guests back to the 1940s. Colorful vintage poster art and photos, booths lined with bright red vinyl, unfailingly upbeat music, candy-striped servers with gobs of good vibes and of course the multitudes of handmade shakes and malts – these are the consistent feel-good factors that have satisfied our sense of nostalgia, along with our taste buds, for over thirty years. Small “local” tweaks to the concept make Ruby’s locations across Orange County (and the country) feel like they are part of the community, which they are. The original restaurant, Ruby’s on the Pier in Huntington Beach, sports a nautical décor while Ruby’s at South Coast Plaza showcases glamorous vintage Vogue photographs. Every part of Orange County is home to a Ruby’s. Families flock to Ruby’s because it’s a restaurant where kids actually have fun. I personally had a blast when my parents would take me there. In fact, I loved it so much that I had my 18th birthday party at Ruby’s on the Pier. The delicious shakes, the decorated kid’s meal with that 40’s feel and the hoppin’ atmosphere make Ruby’s a place to capture a child’s imagination while pleasing the palette. And those fun little paper hats? Irresistible. As a raised-on-Ruby’s adult, today I may or may not resist the paper hats. But there are some things I never resist. 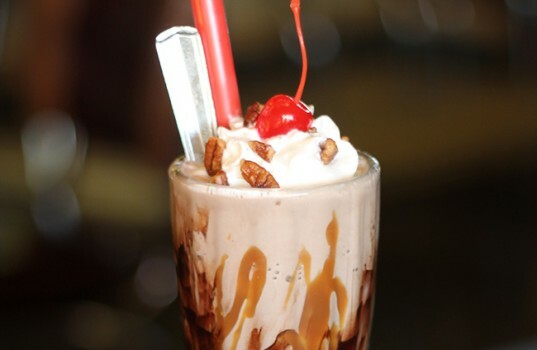 I like to start my visit with the chocolaty, butterscotch-y, nutty Chocolate Turtle shake. (You can’t go wrong with the Chocolate Turtle even though there are 22 other flavors, and usually a featured one, too.) Next up are the Spicy Jalapeño Jack Cheese Sticks. They are my absolute, untiring favorite, and I pity any poor soul who has never tasted them. On a recent visit I wanted to give one of Ruby’s popular items a try, so I experimented with their Mushroom Swiss Burger; out of my comfort zone, but I was pleasantly satisfied. With such a broad menu, at Ruby’s it’s easy for everyone to have an enjoyable visit. New to Ruby’s is a brunch menu. From omelets to the griddle, this brunch menu is nearly as large as the lunch and dinner menu. Featuring vegetarian and low calorie dishes as well as crowd favorites, Ruby’s take on brunch is a fresh addition to their now traditional offerings. Also new is online ordering for Ruby’s Shake Shack at Crystal Cove in Newport Beach. It’s easy to do all the ordering on the computer and then a quick drive to the shack for a breath of fresh sea air and delicious dinner pick-up – no waiting. And if you’re reading this on a Tuesday, make the Ruby’s in your community your dinner destination tonight and, with the purchase of an adult entrée after 4pm, your child under twelve years old eats free – paper hats included.